As a fortified city, it was of strategic military and political significance. Although a direct Fiefdom of the Holy Roman Emperor, the city obtained a municipal charter; the acquisition of Breda, through marriage, by the House of Nassau ensured that Breda would be at the centre of political and social life in the Low Countries. Breda had a population of 183,456 in 2017; the metropolitan area had a population of 324,812. It is part of the Brabantse Stedenrij. In the 11th century, Breda was a direct fief of the Holy Roman Emperor,  its earliest known lord being Henry of Brunesheim (1080–1125). The city of Breda obtained a municipal charter in 1252. After that Breda had the rights to build fortifications. The city constructed brick walls and Roman-style gates. John III was Duke of Brabant, Lothier, and Limburg (1312–1355). He was the son of John II, Duke of Brabant, and Margaret of England. Tommaso di Andrea Vincidor was an Italian Renaissance painter and architect who trained with Raphael and spent most of his career in the Netherlands. He was also called Tommaso Vincitore, Tommaso da Bologna and Thomas Polonier. After a ten-month siege in 1624–25, the city again surrendered to the Spaniards, now led by Spinola; the event was immortalized by Diego Velázquez. In the Siege of Breda of 1637 the city was recaptured by Frederick Henry, Prince of Orange, after a four-month siege, and in 1648 it was finally ceded to the Dutch Republic by the Treaty of Westphalia. The exiled Stuart Charles II of England resided in Breda during most of his exile during the Cromwellian Commonwealth and Protectorate, thanks to the proximity of Charles's sister Mary, Princess Royal and Princess of Orange, the widow of Prince William II of Orange (died 1650). Based mostly on suggestions by the Parliamentarian General George Monck, Charles II's Declaration of Breda (1660) made known his conditions for accepting the crown of England, which in the event he was to regain a few months later in the year. The Treaty of Breda was signed in the city on 31 July 1667, bringing to an end the Second Anglo-Dutch War in which the Dutch faced the same Charles II who had been their guest. Between 1746 and 1748 it was the site of the Congress of Breda, a series of talks between Britain and France aimed at bringing an end to the War of the Austrian Succession, which ultimately led to the signing of the Treaty of Aix-la-Chapelle. During the Second World War, the city was under German occupation. It was liberated following a successful outflanking manoeuvre planned and performed by forces of 1st Polish Armoured Division of General Maczek on 29 October 1944. Each year during Liberation Day festivities, Breda is visited by a large Polish contingent and the city of Breda reserves a special portion of the festivities for the fallen Polish soldiers. A museum and a monument honoring Maczek and the Polish 1st Armoured Division stands in the city center. General Maczek and many soldiers of his division are buried in the nearby Polish military cemetery. Breda was the site of one of the first panopticon prison establishments, Koepelgevangenis. This prison housed the only German war criminals ever to be imprisoned in the Netherlands for their war crimes during the Second World War. Known as the Breda Four, or "Vier von Breda", they were Willy Paul Franz Lages, who was released in 1966 due to serious illness, Joseph Johann Kotälla, who died in prison in 1979, and Ferdinand aus der Fünten and Franz Fischer, who were both released in 1989 and died later the same year. Topographic map image of the city of Breda, March 2014. Click to enlarge. Historically, economic activities were mainly industrial. Breda was a center of the food- and drink industry. Companies like Hero (lemonade), Van Melle (Mentos), De Faam (liquorice) and Kwatta (chocolate) are famous throughout Western Europe. Breda also had a sugar factory, supplying its best-known products. The main shopping areas of Breda are the city centre and the southern part of Breda. Known shopping centres are De Barones and 't Sas. Major shopping streets are the Eindstraat, Ginnekenstraat [ nl ], Wilhelminastraat and Ginnekenweg. A market is held on the Grote Markt every Tuesday and Friday from 09:00 to 13:00. A book and antique market is held on Wednesday from 09:00 to 17:00. The Grote Kerk (Great Church) or Onze Lieve Vrouwe Kerk (Church of Our Lady), a major example of the Brabant style of Gothic Architecture. Saint Anthony's Cathedral (Sint-Antoniuskathedraal), the cathedral church of the Catholic Diocese of Breda. The spoken language is West Brabantian, which is very similar to colloquial Dutch. Musical events are held in the Chasse Theater. Redhead Day is a festival that takes place each first weekend of September. The two-day festival is a gathering of people with natural red hair, but is also focused on art related to the colour red. Activities during the festival are lectures, workshops and demonstrations. The festival attracts attendance from 20 countries and is free due to sponsorship of the local government. Furthermore, some people refer to Breda as the opposite of burning man. Breda's football club, NAC Breda, plays in the highest Dutch league, the Eredivisie after being promoted from the Eerste Divisie in 2017. Breda's athletics club, A.V. Sprint [ nl ], is the largest club of its kind in the Netherlands. Breda's Golden Glory, is a kickboxing camp. Every year in the month of October, the Bredase Singelloop [ nl ] is a major road running event on the half marathon distance with a field of national and international athletes. Charles II of England, lived in Breda for most of his exile during the Commonwealth of England. His sister, Mary, Princess Royal and Princess of Orange was widow of Stadtholder William II, Prince of Orange and co-regent for their son William III sovereign Prince of Orange and later King of England, Scotland and Ireland. "Colonel" Thomas Parker, the manager of Elvis Presley, born and raised in Breda as Andreas Cornelius van Kuijk. Breda is the birthplace and home to several internationally famous electronic dance music artists including R3hab, Dannic, W&W along with former World No.1 DJs — Tiësto and Hardwell. The title of their 2011 collaboration track, Zero 76 is derived from the dialing code of Breda. 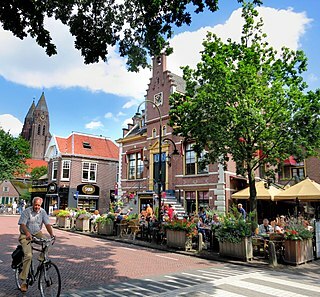 Breda is also the birthplace of former Olympic swimmer Karin Brienesse and former field hockey player Remco van Wijk, who twice won the gold medal at the Summer Olympics with the Dutch National Team: 1996 and 2000. Breda has two railway stations, Breda and Breda-Prinsenbeek, providing connections north to (Dordrecht, Rotterdam, Den Haag) and Amsterdam; east to Tilburg, Eindhoven, Den Bosch, Nijmegen and Zwolle; west to Roosendaal and Vlissingen and south to Antwerp and Brussels (via the HSL-Zuid high-speed line). Breda Oost railway station will open after 2020. The A16 is a motorway to the north to Rotterdam and towards the south to the Belgian border to Antwerp. The A27 is also a motorway to the north; It connects Breda with Utrecht. Furthermore, The A58 connects Breda with Tilburg and Eindhoven. Buses are operated by Arriva. There are four kinds of buses in Breda: citybuses, regional, Volans and long-distance. Citybuses drive only within Breda (sub-12 numbers), regional buses provide connections to nearby towns and cities, Volans buses are more luxurious buses driving to Etten-Leur and Oosterhout (31x and 32x-buses), and long-distance 'Brabantliners' connecting both Gorinchem and Utrecht with Breda (401, 402). There is also one Zeelandish busline (19) which connects Breda with Hulst and Antwerp, operated by Connexxion. Baarle-Nassau is a municipality and town in the southern Netherlands, located in province of North Brabant. It had a population of 6,803 in 2017. The town is the site of a complicated borderline between Belgium and Netherlands, with numerous small exclaves of Belgium, some of which contain counter-exclaves of the Netherlands. Schijndel is a town and former municipality in the southern Netherlands, in the province of North Brabant. Schijndel is located approximately 14 kilometres (8.7 mi) southeast of 's-Hertogenbosch. Schijndel was founded on 6 December in the year 1309. On 1 January 2017 Schijndel, together with Veghel and Sint-Oedenrode, merged into a new municipality called Meierijstad creating the largest municipality of the province North-Brabant in terms of land area. Sint-Michielsgestel is a municipality and a town in the southern part of the Netherlands. It is located directly south of 's-Hertogenbosch, the capital of North Brabant province. Its name refers to archangel St. Michael. The Metropoolregio Eindhoven, until 1 January 2014 the Samenwerkingsverband Regio Eindhoven is a regional governmental agency for the city region of Eindhoven, Netherlands. The MRE comprises 21 municipalities in the Eindhoven agglomeration, with a total area of 1,457.81 square kilometers. The region has nearly three quarters of a million inhabitants and some 35.000 companies. 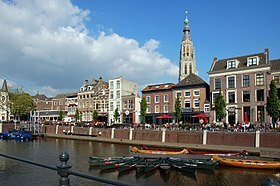 The following is a timeline of the history of the municipality of Breda, Netherlands. ↑ "de heer P.A.C.M. van der Velden" (in Dutch). Gemeente Breda. Archived from the original on 10 April 2014. Retrieved 12 April 2014. ↑ "Postcodetool for 4811DJ". Actueel Hoogtebestand Nederland (in Dutch). Het Waterschapshuis. Retrieved 15 April 2014. 1 2 "Bevolkingsontwikkeling; regio per maand" [Population growth; regions per month]. CBS Statline (in Dutch). CBS. 27 October 2017. Retrieved 27 October 2017. 1 2 "Bevolkingsontwikkeling; regio per maand" [Population growth; regions per month]. CBS Statline (in Dutch). CBS. 26 June 2014. Retrieved 24 July 2014. 1 2 Chisholm, Hugh, ed. (1911). "Breda" . Encyclopædia Britannica (11th ed.). Cambridge University Press. ↑ The Prince of Orange and subsequently King or Queen of the Netherlands continued to use the title; today Queen Beatrix uses the title Baron of Breda. ↑ "Spanjaardsgat" . Retrieved 22 August 2017. ↑ "Brew coup as Breda is made in Guernsey « This Is Guernsey". Thisisguernsey.com. Retrieved 2013-03-12. ↑ "Breda". Randalls Brewery. 2012-11-22. Retrieved 2013-03-12. ↑ "Contact." Koch Media. Retrieved on September 13, 2016. "Benelux Koch Media Benelux Princenhagelaan 1 C4 4813 DA Breda Niederlande"
1 2 "Kerkelijkheid en kerkbezoek, 2010-2014". Centraal Bureau voor de Statistiek. ↑ Stephen Gaukroger. Descartes: An Intellectual Biography. Oxford University Press, 1995.